Saporific | [sap-uh-rif-ik] Having the power to produce the sensation of taste; producing or imparting taste, flavor, or relish. On the warm days of summer, the last thing I want to do is spend a long time—or really any time—cooking in a hot kitchen. But sometimes a purely cold, uncooked meal just doesn’t cut it, you know? This quick meal combines the light, fresh flavors of summer with the sole cooking requirement of making rice. The hot rice gently wilts the spinach and dill, slightly softens the feta cheese, and provides a warm, savory contrast to the sweet little tomatoes and tart lemon. I’ve made this rice salad at least a half-dozen times over the summer because it’s so simple, healthy, and tasty. Paired with a crisp chardonnay or sauvignon blanc, it’s a perfect summer meal! Toss to combine evenly and add salt and pepper to taste. Serve warm, preferably with a crisp white wine. This will make 2-3 dinner-sized servings or 6 side dish servings. The quantities of ingredients are rough guidelines to make it how I like it best, but you can increase the rice and decrease the spinach if you prefer that ratio. The rice can be cooked however you like (including the microwave, if you really don’t want to heat up the kitchen! ), though I use a rice cooker since it keeps the rice warm until the other ingredients are ready. I find that it takes me a leisurely ten minutes—depending on whether I’ve already poured a glass of wine—to zest and juice the lemon, crumble the feta, and wash and cut the vegetables. For a recent celebration, I made my berry tart again—this time with more crisp pictures from my awesome new camera!—and it continues to be a favorite. I’ve learned that the gluten-free tart crust is definitely easier to make consistently the right consistency (heh) using the food processor rather than the mixer. It’s easier to notice the transition from crumbly to sticky with the food processor, whereas the mixer makes a tougher crust if you let it mix just a tad too long (which is not at all difficult to do). Though really whichever implement I use to make the crust, either for the berry tart or the citrus one, people have gone back for seconds! I used to think that mashed potatoes were my ultimate comfort food. I was wrong. Mashed potatoes can sometimes be too smooth, or not creamy enough, or so filled with butter that the guilt outweighs the comfort. (Don’t get me wrong, though—perfect mashed potatoes are akin to heaven!) However, these roasted potatoes have far surpassed the title once held by their mashed siblings; they’re the perfect blend of crispy on the outside and smooth on the inside, a bit salty, a bit tangy, and topped with dilly freshness. Plus, they’re nearly impossible to ruin! Preheat the oven to 450 degrees. Line a baking sheet or large roasting pan with aluminum foil, and brush 1 tablespoon of the olive oil over it to coat. Whisk together the remaining olive oil and mustard in a medium bowl. Add the potatoes and toss until coated. On the prepared tray, spread out the potatoes in a single layer. Put tray into the oven and roast until the largest of the potatoes can be pierced pretty easily with a fork (about 20 minutes). After removing the tray from the oven, lightly sprinkle the roasted potatoes with salt and pepper to taste. Transfer them to a serving bowl and toss with the fresh dill. Mixed baby potatoes are probably best here—I like the smooth texture of yukon gold and red potatoes, but adding little purple ones mixes it up a bit. When they’re roasting, don’t worry if they don’t quite cook evenly. If a couple get a little too browned, they just add contrast! These potatoes are perfect hot with eggs for breakfast, room temperature for a picnic or party, or cold, straight from the fridge when you can’t resist their siren call! If I were ever to run a food truck, I’m pretty sure my main offerings would start out with Pad Thai and sticky rice with mango. With the addition of a nice, fresh salad with sesame ginger carrot dressing, my version of a perfect three-course meal would be covered! Sticky rice with mango is quite possibly my favorite dessert, serving up the contrasts of sweet/salty/tart and warm/cool simultaneously. Until recently, I was reliant on Thai restaurants (which don’t always have the dessert available) to get my fix. Well, thanks to Chef Jen Knapp and my cooking class at Tante Marie’s in April, I am no longer a slave to the whims of Thai restaurants; all I have to do now is to remember to soak rice the night before I want this scrumptious dessert! In the United States, it’s easiest to find Tommy Atkins mangos in the grocery store, which are the plump, roundish ones that turn a purplish red when fully ripe. Don’t be afraid to stick them up near your nose, because the tastiest ones do smell nicely of mango. (Underripe ones don’t really have any scent.) A ripe mango of this type is super sweet and will definitely taste good with the salty/sweet rice. For a special treat, though, it’s worth trying to find Ataulfo mangos. Also known known as manilla or Champagne mangos (among other names), they have yellowish orange skin when ripe and are most closely related to the variety that is common in Thailand (although the ones we find here are primarily from Mexico). Based on a highly scientific taste test with Caitlin (not really, I just happened to have both on hand! ), the Ataulfos are just slightly more tart but counter with a lot more depth of flavor and a silkier texture that has the extra bonus of being way easier to slice away from its thin pit. Palm sugar is my new favorite sweetener. On its own, it already somehow tastes like sweetened condensed milk, so it seems inevitable that palm sugar is perfect mixed with coconut cream for an amazing sauce. If you can’t find it, I’m sure you could substitute regular granulated sugar; but if you have an Asian grocery store available, it’s worth it to find the palm sugar (sometimes found in a jar, but preferably found in a block that you can just cut small slices off with a large knife). Be sure to get a can of regular coconut milk for this recipe (not light), and do not shake it. Once you open it, the coconut cream can be scooped out from the top with a spoon, leaving the translucent coconut milk at the bottom. The proportions in one can should be pretty much exactly the right amounts of cream and milk for one recipe. Soak the rice in cold water for at least 4 hours (preferably 8 hours or overnight). The rice will increase in volume by 50%. To cook the rice, bring a couple inches of water to a boil in a large pot. While the water is coming to a boil, line a steamer basket with one square of the cheesecloth. (The excess corners of cheesecloth should hang over the sides of the pot.) Drain the rice and pour it into the cheesecloth-lined steamer basket. Place the steamer basket into the pot over the boiling water, draping the loose cheesecloth over the rice so it fits under the lid of the pot. Cover and steam for 20 minutes. In order to cook the rice evenly, remove the packet of hot, half-cooked rice from the steamer basket and reline the steamer basket with the other piece of cheesecloth. Carefully invert the rice into the steamer basket again and steam for another 15 minutes. While the rice is cooking, prepare the rice seasoning, coconut sauce, and ramekins. For the rice seasoning, combine the coconut milk, granulated sugar, and salt in a small saucepan. Simmer over low heat, stirring frequently until the sugar has dissolved (about two or three minutes). Set aside. To prepare the coconut sauce, combine the coconut cream and palm sugar in a small saucepan, simmering and stirring over low heat until the sugar has dissolved. Remove from heat (and perhaps transfer to a small carafe for easy pouring). Line six 4-ounce ramekins (or other small dishes) with plastic wrap (approximately 8-inch squares), leaving excess wrap open over the tops. Set aside until the rice is completed. Once the rice has finished steaming, remove it from the cheesecloth and transfer the rice to a large bowl. Gradually stir in the rice seasoning until all seasoning has been absorbed. When ready to serve, unwrap rice and invert onto plates. With a fork, poke lots of holes all over the top of the rice to absorb the coconut sauce that you’ll then pour over it (a little more than a tablespoon or so per serving). If there is excess coconut sauce, serve on the side so people can add more to their taste. 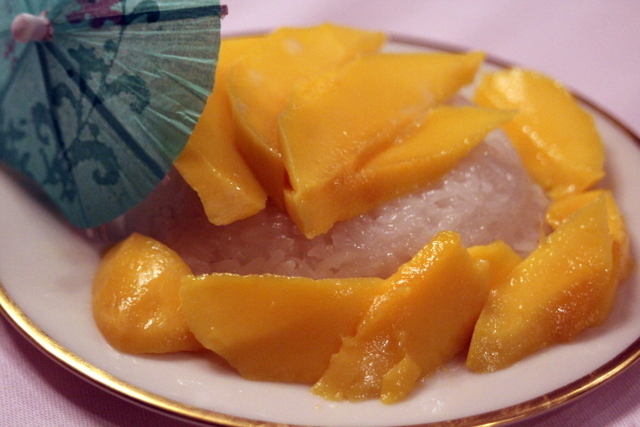 Place mango slices on top of the rice, and garnish with toasted coconut. Serve, salivate, and enjoy! As it turns out, no fancy equipment is necessary. I don’t have a great steamer like at the cooking school, but my rice turned out well just being steamed in a normal steamer basket. Though cheesecloth works best, I’ve also improvised with linen dishcloths! For Mother’s Day, my family threw a luau for my mom, and sticky rice with mango topped off the whole affair. If the food truck thing ever happens, I’ll guarantee that the sticky rice with mango will be served—by vehement request from my sister—with extra coconut sauce on the side! A couple weeks ago, I took one of the most energizing classes I’ve yet to experience. Sorry, library school, but my Southeast Asian street food cooking class at Tante Marie’s was more exciting than User Needs and Behavior in Theory and Practice (which, um, actually was one of my favorite classes—yeah, I realize that makes me a nerd). At the start of the class, our instructor, Jen Knapp, gave us a great intro to the standard South Asian ingredients we’d be using, including Vietnamese coriander, turmeric root, shrimp paste, lemongrass, dried shrimp, tamarind, and palm sugar, just to name a handful. Following Jen’s intro to ingredients and assignment of recipes, a temporary span of organized chaos ensued when she set us free with, “Okay, find your ingredients and a work space!” I’ll admit this was daunting at first (huh? where are the knives in this kitchen I’ve never been in before? ), but we all figured things out pretty quickly with the help of Jen and her assistant. Throughout the class—incidentally, the speediest passing of five hours I’ve experienced in a long time!—Jen called everyone over to watch techniques that weren’t necessarily obvious from the recipe (e.g., rolling spring rolls, deveining shrimp, making tamarind pulp, the quick succession of Pad Thai stir frying). Even though we all only made one or two things ourselves, I feel confident about attempting any or all of the recipes at home. Pad Thai was the recipe I ended up being responsible for in the class, I think because I mentioned that my husband has been on a quest of his own to make perfect Pad Thai. Since the name basically means “Thai noodles” there’s no definitive recipe, I suppose. I can say for the record that this recipe is by far my favorite, and I have tried many a version at excellent Thai restaurants (and some excellent attempts by Dan!). I’ve now made this three times on my own, even transporting the difficult-to-find ingredients to North Carolina to make it for my mom and sister! I’ve tweaked it just a little from the recipe in class, but everyone I’ve made it for thus far has been pretty smitten with it. My friend Jon, who experienced my first home attempt (in which I even forgot the bean sprouts), said that he never orders Pad Thai at restaurants, not because he doesn’t like it, but because he enjoys other Thai dishes more. This version, however, he says he’d order! The key to this dish is getting everything prepped in little bowls right next to your wok, since you’ll want to just throw in ingredients in quick succession once the wok is super hot. Don’t worry about measuring exactly—just try to make sure you use about the same amount in each batch so that everyone gets all the ingredients! By the time you’ve made the last serving, you’ll be a pro! In a medium saucepan, cook the tamarind pulp, fish sauce, and palm sugar over medium heat until the ingredients have melted together (i.e., the palm sugar has dissolved). Add the chili powder a little bit at a time, until it is spicy enough for your tastes. The sauce will be super concentrated—it will be mixed with very bland noodles, so don’t fret if it’s crazy potent!—and you should taste it as salty, mildly sour, then a little sweet, and then a bit hot. Heat the wok over high heat, then add a splash of vegetable oil (which will smoke slightly if the wok is hot enough). Immediately add a sixth of the tofu and about a tablespoon of sauce. Cook, stirring frequently, until tofu is slightly brown and crisp (a couple minutes). Brace yourself for some rapid-fire cooking! Add a large handful of noodles to the wok, as well as 1/4 cup of sauce. Stir vigorously in order to keep the noodles from sticking, continuously moving everything in the wok. If the noodles are still a little undercooked or if the sauce evaporates too quickly, add a splash of water to help them cook. Once the noodles are cooked (which should only take about a minute), push everything over to one side of the wok and crack an egg in the middle. Mix the egg up a little bit, and after it’s mostly cooked (about 10 seconds or so), mix the noodles and egg together. Add 1 tablespoon each of garlic, pickled turnips, and chopped peanuts, a teaspoon of dried, pounded shrimp, a handful of bean sprouts and about a quarter cup garlic chives. Add a little more sauce if you like. Cook very briefly, just long enough to heat through and toss everything together. Turn off the heat and serve immediately, garnished with chopped peanuts and wedges of lime. Wipe any largish bits of food out of the wok, and repeat with remaining ingredients. Make sure to taste the first batch so you know if it’s any good (and so you can tweak proportions to your taste as necessary). There are many tamarind products available, including tamarind paste (which is super concentrated and may need to be diluted to be the ideal concentration). To make tamarind pulp from moist-but-dried tamarind (found in a block at Asian grocery stores), pull off about 3/4 cup of the tamarind from the block and place it in a small bowl. Just barely cover the tamarind in boiling water and let sit for about 15 minutes. Once it’s tolerably cool enough to touch, grab a handful of the tamarind and squish it through your fingers to separate the seeds from the pulp. (It’s definitely messy, but totally fun!) After squishing it as much as you can, press the pulp and liquid through a coarse sieve to separate out the seeds. Voilà! The liquid pulp is ready to use, and you have super messy but tasty fingers. The recipe I made at Tante Marie’s included using 1 1/2 pounds of fresh shrimp, which you throw in and cook early on with the tofu. My husband isn’t a seafood fan—and I’m not much of a fan of peeling and deveining shrimp, as it turns out—so I like just using tofu. You could also use bite-sized pieces of chicken or other meat of your choice, as well. The original recipe calls for more of the dried shrimp as well, but when making it without the fresh shrimp, too much of the dried shrimp made the dish taste a little too “fishy.” Play with proportions to suit your tastes, though! 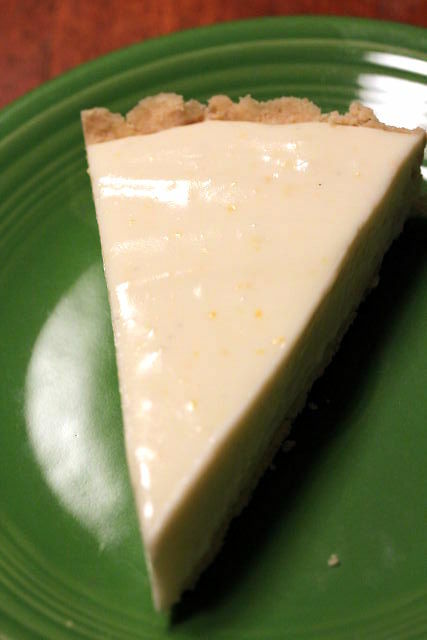 The fall and winter, though, are when so many other amazing tart citrus fruits are in season, so my family has adapted this pie to be perfect for all seasons. In November, I jumped on a Freecycle offer for someone’s excess calamansi fruit (I grew up knowing them as calamondins), juiced a ton of them, and made my mom’s version of this tart. Unprompted, my husband decreed that it was “what Creamsicles bow down and worship as a god.” Perhaps it’s an exaggeration—or perhaps Penzeys’ double strength vanilla extract has mystical powers—but I’ll take it! Blend cream cheese, sweetened condensed milk, juice, zest, and vanilla in blender or food processor until smooth and slightly fluffy (a minute or two), scraping down the sides occasionally. Pour filling into prepared tart or pie crust, smoothing it out evenly in the crust. Chill for a couple hours so the filling can thicken a bit, then gleefully serve. You can use regular cream cheese, of course, but it’s so good as a lighter version that I don’t know why you would. If you want a few more fat calories, serve the pie topped with some whipped cream! This recipe has been written on so many napkins and been relayed over innumerable phone calls among my family, so while it may not be the original, it’s definitely been thoroughly tested! It is so hard to find a good caramel. One that makes your eyes soften, your shoulders relax, and provokes an involuntary exhale as the caramel is released from its thin chocolate shell. One that melts like butter when it hits your tongue and engulfs your whole body in blissful warmth as the flavors dance upon your taste buds. To be honest, I don’t think I knew that caramels this good existed before now, though I’d certainly hoped. Christopher Elbow, you are now one of my food heroes. Since my Dan is into whiskey and scotch, I automatically chose the Whiskey Walnut (“walnut marzipan topped with a whiskey ganache”) and Single Malt Scotch (“dark chocolate ganache infused with 12 year old single malt scotch”). Incapable of choosing between any of the other beautiful morsels in front of me, I asked the salesperson which ones were her favorite, thus ending up with Black Currant (“black currant paté de fruit topped with dark chocolate ganache and cassis”), Caramel with Fleur de Sel (“a soft caramel ganache made with French sea salt”), and a heart-shaped Passion Fruit caramel (“caramel made with the tropical taste of passion fruit”) to top it off. All of the chocolates had an incredibly smooth texture, especially the single malt scotch, which was silky with just a subtle hint of scotch. The black currant contrasted the dark chocolate with wonderful, slightly tart berry flavor. Alas, neither of us could really taste the whiskey in the whiskey walnut one, but I certainly can’t say it wasn’t still tasty! (It could have been the wine and very garlicky pizza we had for dinner immediately beforehand, though, so perhaps we’ll simply just have to try it again.) As you’ve probably figured out by now, though, the caramels were our favorite. Incredibly smooth, with not even a hint of the usual stick-to-your-teeth quality of most caramels. My next trip to the shop will definitely entail trying each and every caramel—starting with the rosemary and lavender ones—in order to determine whether this bliss is sustainable. Someone has to do it, right? 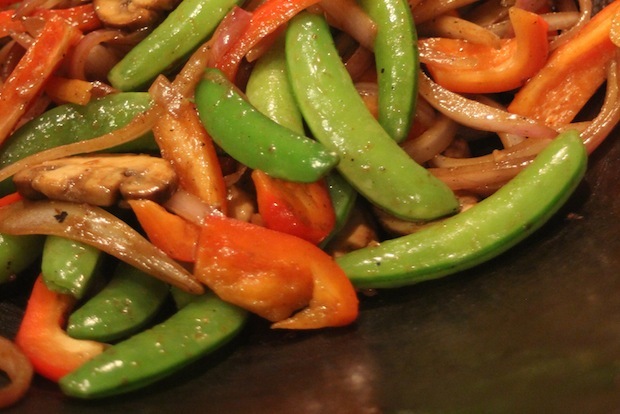 Stir fry is one of those meals that withstands—and even relishes—improvisation. Pretty much any vegetable or protein is fair game, and you can nearly throw the kitchen sink into the sauce. It’s become one of the go-to meals my husband gravitates towards when it’s his turn to cook, and I must admit that he has become quite the masterful stir fry sauce creator. After desperate pleas to let me write down the ingredients of his sauces so my friends and I might have some chance of recreating some of his most flavorful sauces (usually he just throws things in without measuring), I managed to snag two, now tested on numerous occasions. The first sauce has an amazing complexity of flavors; it’s salty, tart, spicy, sweet, fatty/meaty/savory (let’s call it umami-y? 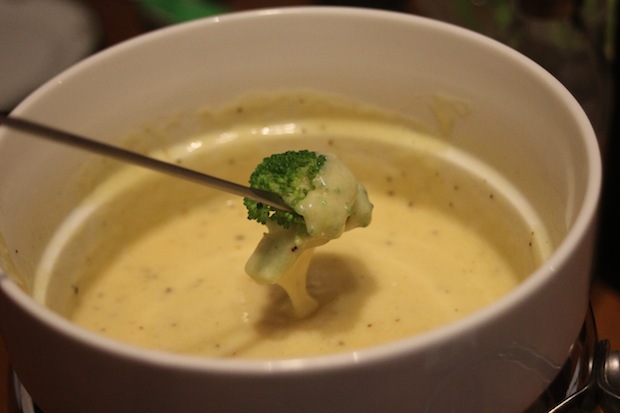 ), and complements broccoli particularly well. As a matter of fact, my friend Jon’s seven-year-old son, Simon, has recently decided that stir fry is his favorite food, largely owing to his love of this sauce. The first time Jon made the stir fry with tofu and broccoli he told me that he let Simon (then six) try a bite, asking him if he still liked the sauce. Simon replied, “Oh. Yeah. I like this sauce. I think it really makes the stir fry.” I love you, Simon. it, he added the grenadine to balance out the tartness of the tamarind (which he was apparently determined to include). The inclusion of all these ingredients is how a simple stir fry results in the aforementioned long list of adjectives. Prepare sauce before cooking any of the vegetables. 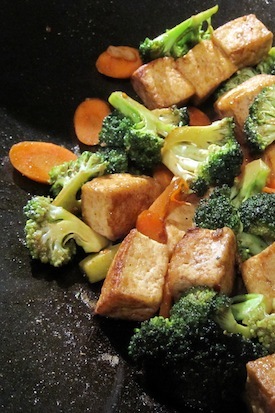 Stir fry your choice of protein and vegetables (preferably with a lot of minced garlic) in about a tablespoon of oil. Once everything is cooked, add the sauce to the pan and stir, cooking for about one minute to let the flavors meld. The second sauce was Dan’s response to my hope for a stir fry with less sodium than is usually found in stir fry sauces. Ironically, it turns out this sauce has the same amount of light soy sauce as the first sauce! I’m still glad I asked for something “different,” though, because it resulted in a delightfully rich and flavorful sauce. (Don’t get me wrong. These sauces are still not low sodium sauces. They are, however, less than usual and definitely less sodium than you’d find in prepared foods.) The balsamic vinegar adds both a little sweetness and tartness, and the ground spices add an earthy depth. Prepare sauce in advance of cooking anything, since time is of the essence once stir frying. Stir fry your choice of vegetables and protein. When veggies are almost cooked, add sauce, toss to coat thoroughly, and cover for a minute or so. Test doneness and repeat stirring and covering until vegetables are cooked. Since there is raw garlic in the sauce, you do need to cook this sauce a little bit more than Sauce No. 1, making it important to add the sauce while the veggies are still just slightly undercooked (unless you like raw garlic, of course!). 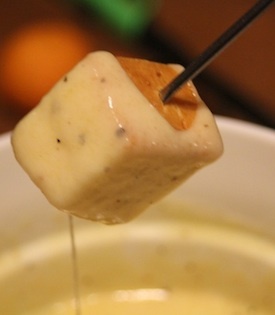 Our New Year’s tradition—”tradition” being now a four year streak—is a very late night cheese fondue with the Haupts prepared after my New Year’s Eve performance in Dallas. Since the concert usually ends after 10pm, dinner ends up being right before midnight, just in time for toasts! We’ve tried out versions with many different cheeses (mmmm…cheese! ), but we decided that this one is our preference. This year we tried not to go overboard (since there are only four of us, and we try to learn from our mistakes), so we cut the recipe to two-thirds and only prepped steamed broccoli and bread for dipping. This meant that, for the first time ever, we actually had room for dessert. Yay! Happy New Year, everybody! Having no inkling that the gluten-free pie crust would actually be better than a wheat crust (I kid you not, it really is! 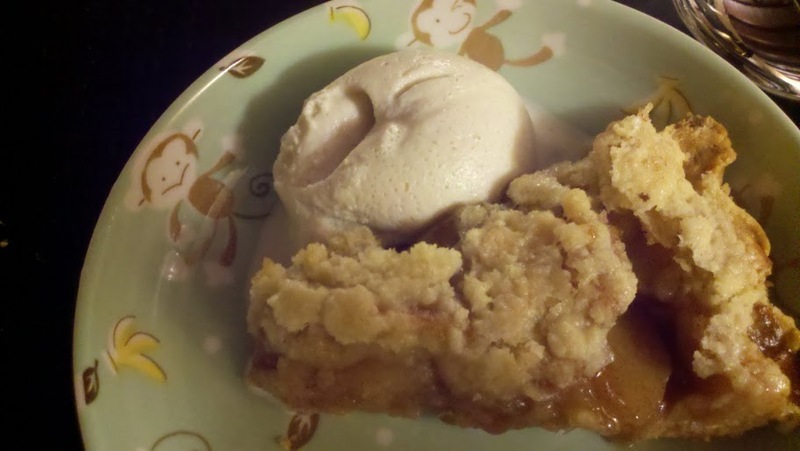 ), I told Dan I’d make him another “normal” apple pie if this one didn’t suit his tastes, which of course resulted in him saying before even tasting it, “Well, I clearly don’t like this one then. I think we’ll need a second pie.” D’oh! Didn’t quite think that through before saying the offer out loud! Anyway, thankfully, this pie crust was so flaky and crispy–even the next day, when a wheat crust would be soggy!–Dan conceded that we could wait until Thanksgiving for the next one. So, just in time, I’m sharing how to make it! After getting pie apple recommendations from my mom (whose mother–whom we called Mimi–made notoriously fabulous apple pies), I went with half late-season Rome apples and half Granny Smith apples, all organic. The Rome apples were a bit soft due to the late season (it was April, after all), but their sweet softness played off the tart, crisp Granny Smiths really well. For the filling, I followed Mimi’s recipe (basically just apples, sugar, lemon juice, cinnamon, and butter—mmm…butter…). For the fall we’ll be getting the nicest tart apples we can find in North Carolina. Mix all dry ingredients in large bowl of an electric mixer. Add butter pieces and mix until the the mixture resembles a crumbly, coarse meal. Add the egg and juice, mixing on low speed until the dough sticks together. Using your hands, form the dough into a ball and place on wax paper. Top with another sheet of wax paper. Partially bake the pie crust for 10 minutes. Cool on rack while preparing the filling and topping. Turn up the oven to 400 degrees. 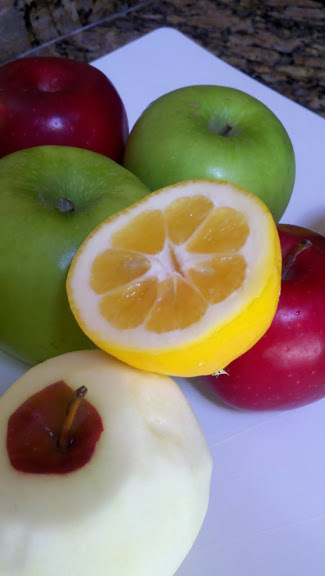 For the filling, slice apples into large bowl and toss with lemon juice. In small bowl, mix dry ingredients, sprinkle over the apples, and toss. Mound the apples into the prebaked crust and dot the top with small pieces of butter. For the topping, combine dry ingredients, then cut in the cold butter until it resembles cornmeal. Spoon over the apple filling and pat down so it doesn’t fall off. Cover pie with aluminum foil and bake for 30 minutes in the center of the oven. Remove foil and turn the oven temperature down to 375 degrees. Bake for 30-40 minutes more, until filling is bubbling and top is golden. If the edges are browning too quickly, cover just the edges with a pie shield or thin strips of foil. Cool on a rack before serving. If you like nutmeg, you can add 1/2 tsp to the filling. I like my apple pie unadulterated with just really high quality cinnamon.